The Upper Mustang comprise the northern two-thirds of Mustang District of Dhawalagiri Zone, Nepal. The southern third of the district is called Thak and is the homeland of the Thakali, who speak the Thakali language, and whose culture combines Tibetan and Nepalese elements. Life in Mustang revolves around tourism, animal husbandry and trade. Mustang is one of those few places on the planet that has survived a very close-niche life and that region was, until recently, was a forbidden land for outsides till 1992. This loneliness and isolation contributed the people of Mustang to conserve their lifestyle and cultural heritage that remained almost unaffected for centuries. 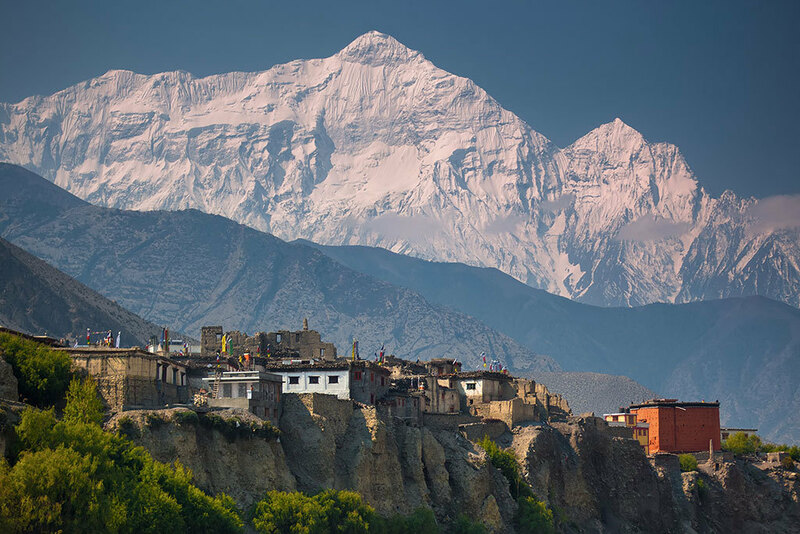 Hidden behind the high Himalaya ranges, Mustang is filled with handsome trekking zones. The high desert rain shadow of Himalayas receives very little rainfall making this region dry and parched, similar to the bordering Tibetan Plateau. The Lo Manthang, capital of Upper Mustang, lies in the remote Himalaya desert behind the Dhaulagiri and Annapurna mountain ranges, is an old traditional Tibetan Village, with rare medieval Buddhist arts and exotic culture. We, Wilderness Excursion offers perfect budget package trips to Mustang in the most competitive trip cost and develop a tailor-made itinerary to meet your time frame for Nepal holiday. The 17-day trip begins in Kathmandu with tours of UNESCO World Heritage Sites. Then we drive to Pokhara and fly to Jomsom the next day and begin trekking. Upper Mustang is also known as the Last Forbidden Kingdom because it wasn’t until the 1990s that tourists were allowed to enter the region. While trekking in the Upper Mustang region of Nepal, we can admire the uniqueness of treeless landscape, rocky trails and views of Nilgiri, Annapurna, Dhaulagiri and the other Himalayas. Day 01: Fly to Pokhara. Relax in Pokhara. Day 02: Fly to Jomsom (8921 ft. 2720m) and trek to Kagbeni (9216ft. 2810m). Day 03: Trek to Chele (10004ft. 3050m) via Tangbe/Chhusang for lunch. Day 04: Trek to Ghilling (11709ft. 3570m). Explore monasteries and village. Day 05:Trek to Ghami (3,460m/11,352ft). Explore monasteries and village. Day 06: Trek to Charanag (11677 ft. 3560m). Explore monasteries and village. Day 07: Trek to Lo Manthang (12,238 ft. 3,730m). Visit monasteries, king´s palace and museum. Day08: Excursion Choser village, back to Lo Manthang after visiting monasteries and caves. Day 09: Trek to Drakmar (3810 m/12,500ft): 6-7 hours via Ghar Gompa. Day 10: Trek to Syangmochen (3,806m/12,484ft): 5-6 hours. Day 11: Trek to Chhuksang (3050m/10,004ft): 5-6 hours. Day 12: Trek to Jomsom (2,700/8,856ft): 6-7 hours. Day 14: Back to Kathmandu. Wants some modification on Upper Mustang Trek itinerary? contact us to customize it.